Born in Damariscotta, Maine. After being raised in Maine, Florida, California and Denver, Geer spends three years in the army, followed by three years at the University of Colorado. 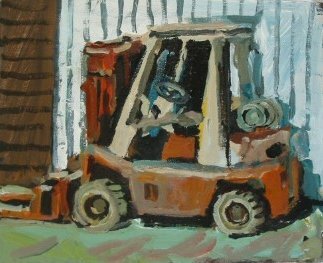 Geer begins serious studies at the San Francisco Art Institute, under the tutelage of Richard Diebenkorn and Elmer Bischoff, masters of the Bay Area School. He completes his Masters in Painting at San Francisco State, where he continues as an instructor. During this period, Geer takes time off to work in the civil rights movement in Mississippi. On returning to San Francisco, he meets his future wife Gwen, while helping to start the Institute's Urban Arts program. Geer and Gwen move to the country to raise their children and create an independent life for themselves. Geer builds his first studio on their 10 acre farm, and begins to come into his own as an artist, first by pursuing portrait commissions, then showing at several smaller San Francisco galleries, and finally finding representation beyond San Francisco. Gumps Gallery, Charles Campbell Gallery, Susan Rush Fine Arts, San Francisco; Dubins Gallery, Capital Group, Los Angeles; Mid-Town Gallery, NYC. Looking to escape the hot summers in Hopland, Geer and Gwen find a small cottage on the coast of Maine. It needs considerable work, but becomes an excellent summer retreat and studio, leading to a continuing series of paintings over many years, looking through the large living room windows into the New Meadows Cove. Unfortunately, Gwen dies suddenly in 1987; Geer eventually resumes his summer pilgrimage to Maine. Realizing the need to adopt a simpler life with fewer responsibilities, Geer leaves the farm in Northern California and relocates to San Diego. He meets Pat, who also divides her time between Maine and California. Rose bushes that Geer plants at the house in San Diego provide the basis for many still lifes. Geer and Pat marry in Maine in 1996, and add on studio space to Pat's house in Maine's western mountain region. Geer realizes he misses the Maine coast, and searches out a new retreat. He and Pat find a house in Lubec, a small seaside town at the easternmost point of the U.S. Here Geer explores the area, using his van as a mobilestudio from which he creates landscapes and other scenes of remote fishing villages. 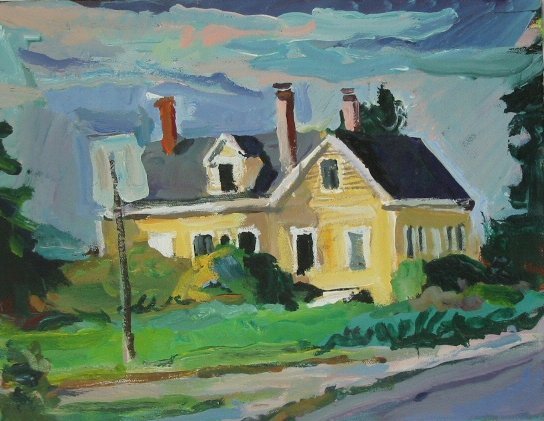 Yellow House, 11" x 14"